For well over a century now, studies of bones, skulls and teeth have produced unreliable conclusions about man’s origin. The fossil evidence allegedly supporting human evolution is fragmentary at best and certainly open to other interpretations. As for the evolution of apes and chimpanzees, supposedly the closest living relative to humans, the fossil evidence is nonexistent. As highlighted in a recent post Macroevolution and Microevolution (03/01/13) this leaves the Darwinian academic leaders in a quandary. Java Man – in 1891 “homo erectus” discovered by a Dutch paleoanthropologist and claimed as the missing link from only a portion of a skull, femur and 3 teeth. Forty years later the “discoverer” conceded it was not a man but was similar to a large gibbon (an ape). He also admitted he withheld part of four other thigh bones of apes found in the same area. Piltdown Man – in 1912 an ape jaw was stained to match a human skull by a zoologist on staff at the British Museum of Natural History. Claimed to be 500,000 years old and absolute proof of human evolution in museums, it is now universally acknowledged as a hoax, yet was in textbooks for more than 40 years. Nebraska Man – in 1922 claimed by the director of American Museum of Natural History with a reconstructive drawing including a wife and family in a natural setting. In truth the only remains turned out actually to be a single pig’s tooth. Exposed as a lie in 1927. Ramapithecus – discovered in 1932 and claimed by 1961 as ancestors to humans by Louis Leakey on the basis of a mere handful of teeth and jaw fragments. By 1982 the supposed “first human” was relegated to an extinct relative of the orangutan. Lucy – this fossil, discovered in Africa in 1974, has been the poster child for transitional apes walking upright. In the late 1990’s it was revealed that Lucy’s anatomy was similar to pygmy chimpanzees. This Australopithecine species, made famous by Louis and Mary Leakey, are probably extinct apes; that is, once again, not at all the sought after “missing link.” In the face of these findings, many evolutionists have silently backed off. Darwin’s theory of macro (not micro) evolution has long been exposed and found wanting, yet it is still positioned as truth to a blithely unquestioning society and sadly accepted by naive students and even many in the Christian community. The Bible has not been refuted. Man was created, he did not descend and evolve. Harsh and ‘black and white’ as that may sound (why are we really so uncomfortable with absolutes? 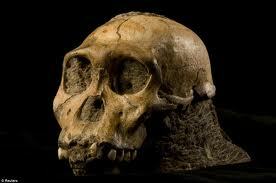 ), the evidence is overwhelming in supporting a Biblical viewpoint of human and natural history origins. If one does not believe, ask yourself, who told you otherwise? Where did you hear or read that? The newspaper? Time Magazine? CBS or NPR? A scientific journal or scholarly paper? A college professor? A book? Think about the source of this information we get everyday. Do the research yourself – you’ll be amazed.